Are you suffering from dry eyes? Do you have symptoms such as itchy, puffy or red eyes? Dry eye syndrome occurs when there are not enough tears on the front of the eyes. It can also be difficult to wear contact lenses and the sensation of itching, irritation and grittiness can result in reduced quality of life. There are many causes of dry eye syndrome which range from climactic conditions (such as exposure to air-conditioning, pollen or pollution), medical conditions (such as arthritis), age and certain medications. 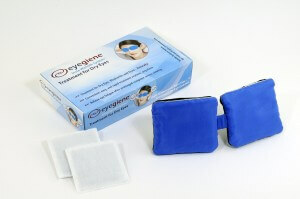 Symptoms of dry eye syndrome can be significantly reduced. For more information on dry eye treatment and what In2Eyes Optometry can do for you, see the section on our website here. Meibomian Gland Dysfunction (MGD) is also thought to be the leading cause of dry eye disease. For more information on MGD including its symptoms, causes and how we can help diagnose and treat MGD at In2Eyes Optometry please continue reading the information in this article or Contact Us to book an appointment with our optometrist or speak to one of our friendly staff for advice. 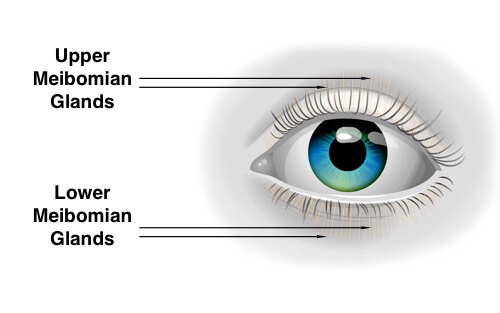 The Meibomian glands exist in both the upper and lower eyelids. There are approximately 25 glands within each eyelid, arranged vertically, near the lashes. These glands secrete oil onto the posterior lid margin: The oil mixes with the tear film to prevent rapid tear evaporation. When these glands are blocked, the glands do not secrete oils and will eventually die off. Blockage of the Meibomian glands can be the cause of dry eye syndrome. Meibomian Gland Dysfunction (MGD) results when the Meibomian glands cease to function optimally. Blocked glands cannot secrete the oils necessary for maintaining a healthy tear film. MGD is believed to be the most common form of lid margin disease—and is thought to be the leading cause of dry eye disease. However, MGD is more than just ‘dry eyes’ or ‘sore eyes’. These symptoms may get much worse for those with MGD and, if left untreated, MGD can result in permanent damage to the eyes. MGD can exist as a single disorder but is often associated with several other diseases such as posterior blepharitis, anterior blepharitis, primary meibomianitis and/or seborrheic dermatitis. Though the term “MGD” covers a wide number of conditions, the major symptoms are blocked oil glands with thickened secretions. If left untreated, these chronically clogged glands are unable to secrete oil and permanent changes in the tear film will result as well as chronic dry eyes. The recognition and treatment of MGD will result in eliminating dryness, inflammation and discomfort and is very simple to treat. Patients with MGD often have red, puffy eyes which have implications socially and at work while the itchiness reduces quality of life. It is often impossible for patients with MGD to wear contact lenses. Diagnosis and treatment of MGD is also a very important step in avoiding complications with cataract and refractive surgery. Dry eyes are one of the most common symptoms of MGD along with redness and itchiness. These are often early signs that there is blockage occurring in the oil glands of the eyelid. However, there are many more symptoms that are associated with MGD. If you are suffering from any of the symptoms listed above then you may have MGD (or any of the related disorders). General discomfort in the eye region of any nature should not be ignored as this is often an early sign of disease and treatment at this stage will have the most benefit and prevent any damage to your eyes. Call us to speak with our optometrist to discuss your symptoms and whether an appointment will be necessary to investigate your symptoms further. There are a number of causes of Meibomian Gland Dysfunction. These factors can present in conjunction with other causes, or alone. Posterior Blepharitis: inflammation of the eyelid sometimes is associated with a bacterial eye infection or certain types of skin conditions such as acne rosacea, eczema or dermatitis. Incomplete or reduce rate of blinking due to overuse of electronic devices. Demodex infection: sometimes presenting as blepharitis, demodex brevis is a species of mite which has been shown to cause inflammation of the eyelids leading to MGD. Contact Lens Wear: extended contact lens wear can increase the risk of dry eyes, MGD and eye infections. Autoimmune disorders or connective tissue disorders such as arthritis, lupus, sclerosis. MGD is often associated with a wider variety of disorders with similar symptoms (such as dry eyes, burning or itching). These are symptoms which can also have other causes (such as allergies) or may also exacerbate symptoms of MGD. For example, patients here in Melbourne may often exhibit itchy and dry eyes due to hay fever. These symptoms may not be caused by MGD but can often be seen in conjunction with MGD. Recent studies have shown that the prevalence of MGD is 38.9% which is a large portion of the population. MGD is very common and, while the symptoms of MGD are wide, it is very easy to detect. Recent improvements in the way that MGD is detected have resulted in a clearer definition of MGD. Accurate diagnosis is based on a standardized grading system and examination of the eyelids with a slit-lamp exam. Clinicians look for symptoms such as oily lid margins, excess or lack of oil in the tear film, dilated or blocked meibomian glands as well as feedback from the patient indicating they have any of the symptoms mentioned above (such as dryness, burning or itching). 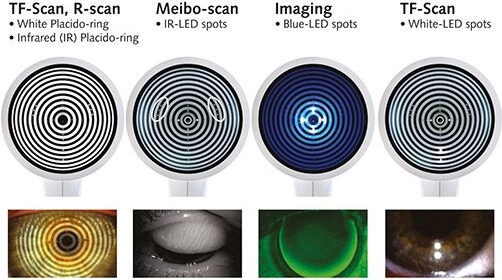 At In2Eyes, we utilise the latest technology in diagnosing Dry Eye Syndrome: The Occulus Keratograph. The K5 contains a high-resolution colour camera with an integrated magnification changer to offer a new perspective on the tear film assessment procedure. During our Dry Eye Assessment we perform a number of tests to assess the health of your meibomian glands and the tear film quality and quantity. 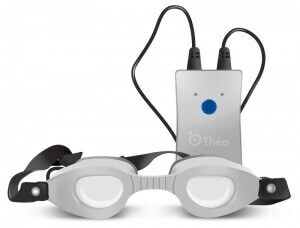 When you come into In2Eyes for treatment of MGD you will receive 15 minutes of therapy with Blephasteam® which delivers a latent moist heat therapy around the eyelids to unblock the Meibomian glands and thus to improve eyelids and ocular health. This has been shown to be far more beneficial than using a warm compress because Belphasteam® delivers a standardised therapy at a consistently safe temperature (which cannot be controlled with warm compress). The Blephasteam® device is convenient, safe, and allows clear vision during the use allowing you to carry out normal task activities such as reading, watching television or playing on your smartphone. Under topical anaesthesia we will unblock the small obstructions and fibrosis that are blocking your meibomian glands (causing their dysfunction). This procedure will be performed in a normal chair in the consultation room with local anaesthetic to reduce discomfort. A specially designed tool called the Mastrota paddle (OCuSOFT), developed by Katherine Mastrota, O.D, unblocks each of the meibomian glands and expresses the build-up of oil. A topical antibiotic/steroid may be prescribed to reduce inflammation after manual expression. As we use a topical anaesthesia (eyedrops), Meibomian Gland Expression is not painful and almost all patients tolerate the procedure with little discomfort. Meibomian Gland Expression takes 20 minutes and it is safe for you to drive home after treatment. How Many Treatments Are Required For MGD? Mild MGD: Requires 1 session plus maintenance. Moderate MGD: Requires 2 sessions plus maintenance. Severe MGD: Requires 3 sessions plus maintenance. Though you may be required to visit In2Eyes Optometry for only 1 or 2 sessions to treat MGD, it is extremely important to maintain good eyelid hygiene as well as combining a variety of therapeutic options which we will explain to you during your appointment. MGD can be treated with a warm compress which stimulates oil production while melting the oil that has solidified in the glands. Other benefits are that it will soften lash debris and soothe your discomfort. Warm compress is not as easy to control for temperature as the Blephasteam® and may be more beneficial for treating discomfort rather than effectively removing blockage. We can show you how to apply a warm compress safely and correctly at home and also supply a specialty kits for chronic dry eye sufferers. These kits may assist in stimulating natural tear production and enhancing the benefits of artificial tears and ointments, punctual plugs and supplements. When you visit In2Eyes for a consultation on MGD we can show you how to do this safely and effectively as over massaging can have a negative impact on your eye health and can induce astigmatism or keratoconus (similar to rubbing your eyes). You can massage both eyelids after applying a warm compress by pinching the lower eyelids between thumb and forefinger to express the meibomian glands. Do this around 5-10 times immediately after warming. While not as effective as visiting In2Eyes for Meibomian Gland Probing & Expression, you can perform your own lid scrub by using a Q-tip or warm washcloth on the tips of your fingers to gently rub along the lash line on both lids (top and bottom). This can help to remove oil, bacteria and debris while stimulating the oil glands. When you visit In2Eyes for a consultation on MGD we can show you how to do this safely and effectively. Pre-moistened wipes are also available for purchase which contain specially formulated ingredients to clear excess oils, dirt and bacteria without causing harm to the eyes. Studies have shown that some people suffering from MGD can benefit by adding omega-3 fats to their diet which can help maintain oil consistency and reduce inflammation. Both Flax Seed Oil and Omega-3 capsules (Fish Oil and Krill Oil) are a source of Omega-3. In2Eyes are also a provider of Lacritec. Lacritec is a new formulation that works from the inside out to provide continuous dry eye relief. Lacritec delivers a proprietary blend of omega fatty acids sourced from Flax Seed, Fish Oil and Borage Oil. This Australian developed, patent-pending formulation works to support a healthy tear film and reduce inflammation. Always follow the advice of your GP if you are taking any medications or suffering from any illness before changing and supplementing your diet. Making a few simple changes to your lifestyle can have a dramatic improvement in dry eyes. Keeping hydrated by drinking enough water and avoiding diuretics like tea and coffee will help keep you and your eyes in good condition. Do not smoke! Not only are you exposing your body to various toxins but the impact of the actual smoke from your cigarettes on your eyes is substantial. Likewise, avoid smoky or hazy environments as well as avoid exposing yourself to extended periods in air-conditioned, windy or breezy environments. There are many other factors that can cause MGD or exacerbate your symptoms. Most people experience some eye discomfort, including dry and sore eyes, so if you feel free to call us at In2Eyes to discuss care and treatment of your symptoms or book in for an appointment if you require a full MGD consultation. Not all eye drops are the same. People suffering from Meibomian Gland Dysfunction require specific eye drops which can alleviate symptoms of dry eyes associated with reduced lipid function. It is preferable to use eye drops which are preservative free. Our optometrists will recommend the right eye drops for you. Hom MM, Martinson JR, Knapp LL, Paugh JR. Prevalence of meibomian gland dysfunction. Optom Vis Sci. 1990 Sep;67(9):710-2.